Meet Fergus! 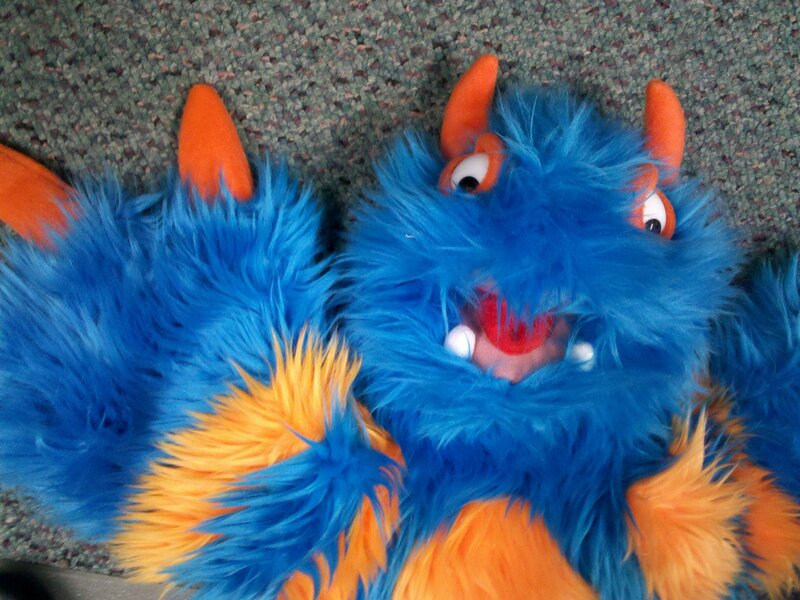 Fergus is a very large, very animated puppet. I named him with the help of the Flannel Friday Facebook group. Unfortunately, I can't remember who it was who suggested the name Fergus (Linda, was it you? or was it Lisa?! ), but I want to give credit to whomever it was. There were lots of great suggestions, but Fergus just stuck. So, this qualifies as a Flannel Friday because I'm sharing my method for using Fergus in storytime. Fergus is our letter monster! He loooooooooves eating delicious letters, but he's very hungry, so after he eats them we have to think of some delicious words that start with that letter. I know I've mentioned them before, but I'm a big fan of this set of Alphabet Soup Starters from S&S Worldwide. There's a 'soup can' for every letter. Inside are cardboard upper and lowercase letters, and a variety of images that start with that letter. On the back of each image the word is printed and the letter is highlighted in a second color. For the vowels there are images for both long and short vowel sounds. I usually tape the images up on my storytime easel to prompt the kids with ideas, especially since many of my storytime kids are on the younger side of things. I ask the kids if they can think of any words that start with our letter of the day, and as they throw out suggestions I pick one, "OOoh, ball is a GREAT "b" word. Buh, buh, BALL listen to that 'b' sound. Ok, let's feed it to Fergus-he's so hungry!" And then we count, "One, two, three, BALL" and 'throw' the word towards Fergus, who gobbles up words being thrown at him from all corners of the room (Think Cookie Monster). It's a really fun shtick, and the kids find it delightful. 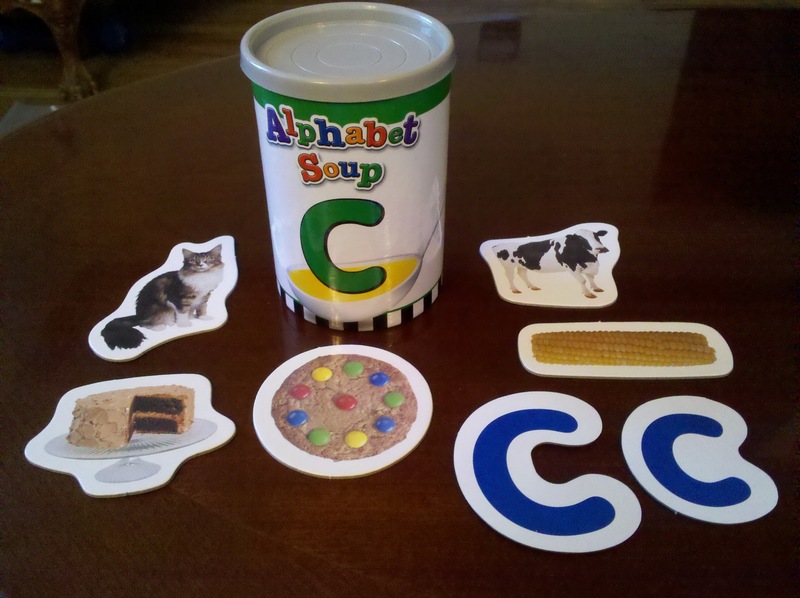 I think it's a great way of making the letter of the day a truly fun part of storytime! **update** if you are looking for ideas to do a letter of the day, but puppets just aren't your thing, check out this post. 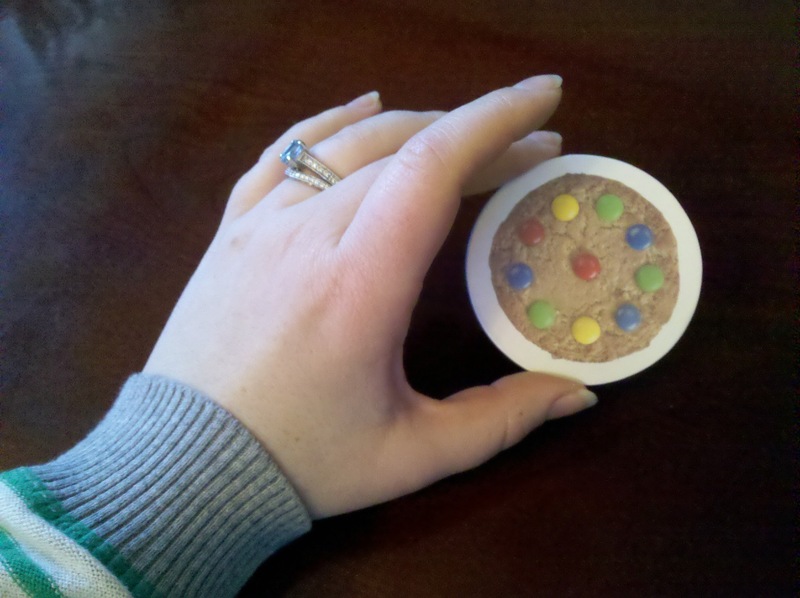 Here's an idea of how big they are. 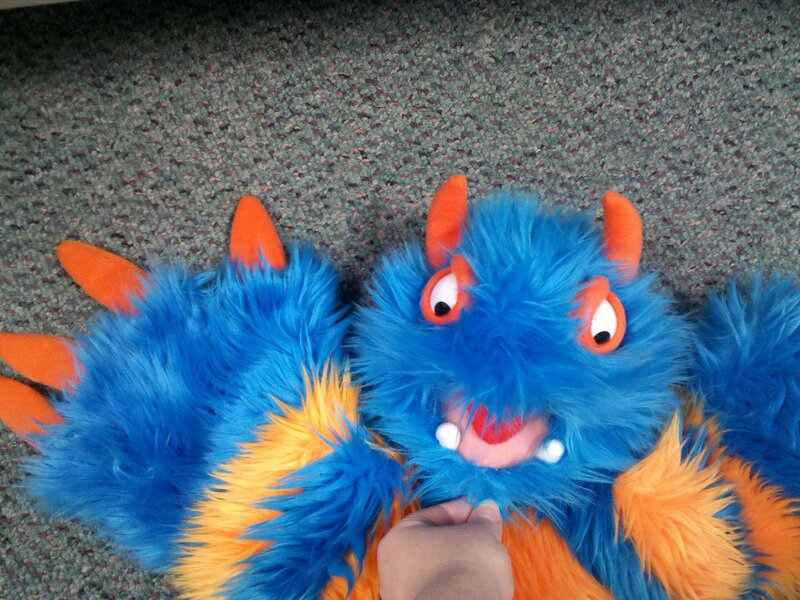 I'm very amused that you are encouraging a monster to eat babies at storytime. Did anyone volunteer their little siblings? I think I'm going to change my example word so it's...less distracting. Editing has the added effect of making ME look like the crazy baby-eating proponent. Well played, Anna, well played. LOL! I was a bad librarian and didn't read through all the comments so I did think you were nuts while I'm searching the post for anything about eating babies. Which would have been really funny, btw. The kids would LOVE it. Great post! Love that puppet and must have him. Even funnier in light of this discussion, today in storytime our letter of the day was "L" and one of the girls was DELIGHTED to offer up her name, "Lila" for Fergus to eat :D Much giggling ensued. LOL @ the baby-eating comments! I love your letter-eating monster. He is adorable! And Fergus is the perfect name for him. :) I agree with your kids ~ this is a "delightful" idea! Wow, Fergus is the perfect name for him and I love the Alphabet Soup component. What great fun! LOL, I have a sock puppet named Fiona who tastes the kid's fingers to see what they've been eating, usually associated with the theme. The kid's love the silly element and usually ask for parents and siblings to have a turn as well.